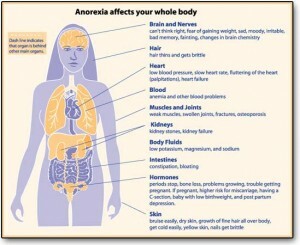 Anorexia may appear as a person start dieting but the condition get worse with time. A person can have a distorted body shape due to unnecessary dieting and techniques used to reduce body weight. Due to such weight loss and dieting activities, person can suffer from starvation along with many health problems like heart problems, kidney damage and osteoporosis. Anorexia treatment centers are available for anorexia treatment. Anorexia can become a long term problem if proper treatment of anorexia is not taken. With proper anorexia treatment, a person can feel better with a healthy weight but if anorexia goes untreated, serious medical problems may result.